John McCain is one of the most admired leaders in the United States government, but his deeply felt memoir of family and war is not a political one and ends before his election to Congress. With candor and ennobling power, McCain tells a story that, in the words of Newsweek, "makes the other presidential candidates look like pygmies." John McCain learned about life and honor from his grandfather and father, both four-star admirals in the U.S. Navy. This is a memoir about their lives, their heroism, and the ways that sons are shaped and enriched by their fathers. John McCain's grandfather was a gaunt, hawk-faced man known as Slew by his fellow officers and, affectionately, as Popeye by the sailors who served under him. McCain Sr. played the horses, drank bourbon and water, and rolled his own cigarettes with one hand. More significant, he was one of the navy's greatest commanders, and led the strongest aircraft carrier force of the Third Fleet in key battles during World War II. John McCain's father followed a similar path, equally distinguished by heroic service in the navy, as a submarine commander during World War II. McCain Jr. was a slightly built man, but like his father, he earned the respect and affection of his men. He, too, rose to the rank of four-star admiral, making the McCains the first family in American history to achieve that distinction. McCain Jr.'s final assignment was as commander of all U.S. forces in the Pacific during the Vietnam War. It was in the Vietnam War that John McCain III faced the most difficult challenge of his life. A naval aviator, he was shot down over Hanoi in 1967 and seriously injured. When Vietnamese military officers realized he was the son of a top commander, they offered McCain early release in an effort to embarrass the United States. Acting from a sense of honor taught him by his father and the U.S. Naval Academy, McCain refused the offer. He was tortured, held in solitary confinement, and imprisoned for five and a half years. 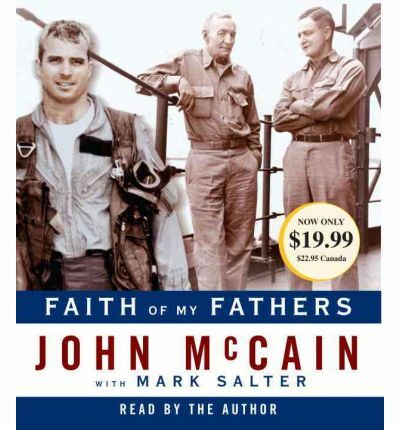 Faith of My Fathers is about what McCain learned from his grandfather and father, and how their example enabled him to survive those hard years. It is a story of three imperfect men who faced adversity and emerged with their honor intact. Ultimately, Faith of My Fathers shows us, with great feeling and appreciation, what fathers give to their sons, and what endures. "From the Hardcover edition." About the Author: After a career in the U.S. Navy and two terms as a U.S. representative, John McCain was elected to the U.S. Senate in 1986 and reelected in 1992 and 1998. He and his wife, Cindy, reside in Phoenix, Arizona.Mark Salter has worked on Senator McCain's staff for more than 15 years. He lives in Alexandria, Virginia, with his wife, Diane, and their two daughters.